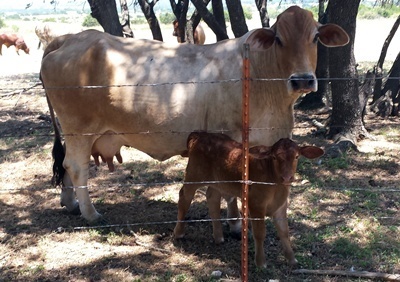 These very special residents of our farm have been bred for gentle dispositions, small calves and rapid weight gain. We bought the farm in 1971 and signed our lives away on a deed of trust for what seemed, at the time, like the rest of our lives. With the farm came a small Horned Hereford herd of 8 cows and a bull. 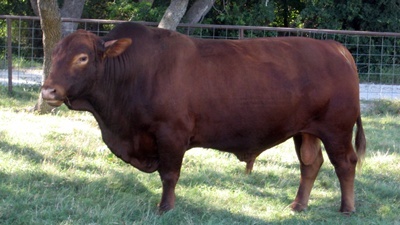 The bull, who we named John Bull, helped teach the new owners the requirements of cattle husbandry. As soon as we could have our well and septic system installed we set out to build our own home. The fences that existed were not there to insulate the house site from the livestock, and our priority was to get our house built. John Bull made himself a regular visitor of the house while it was in the framing state, which posed no major problem. The priorities changed, however, when the 8 foot sliding glass door was installed and he found an intruder facing him - a horned Hereford bull that looked just like him! This discovery resulted in bouts of snorting, pawing and what would have become a headlong charge at the upstart intruder had we not chased the original John Bull away with the broom. The perimeter fence suddenly leaped to priority status on the to-do list. A project of raising 6 Holstein and Jersey bottle calves led us to the next stage of our foundation herd. 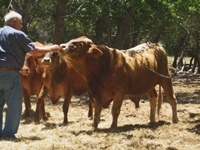 We bred the project heifers to John Bull and kept all of the first and second generation heifer calves. 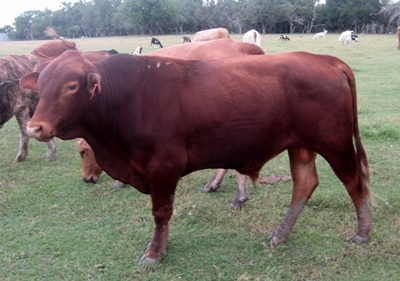 Mixing the beef breed with the milk breed gave us beef type cattle with superior milk production that led to raising fast growing calves. Because of our accidental exposure to a young girl who was a 4H competitor at the Washington County Fair, plus an aging John Bull, we acquired a registered Brahma bull to use as our new herd sire. That was one of the first and possibly the biggest mistake of our cattle experience. His calves were huge, causing the death of one cow, the surgical extraction of the calf on another and assistance with every delivery of the cows bred to him. In addition, he could jump any barrier he encountered and was aggressive, to boot. He took a dislike to the big yellow school bus that trundled the road in front of our house several times every day, and would confront it in the middle of the road, head lowered and temper steaming. After several mornings of having to save the school bus from him, it was clear that he had to find another home. Our neighbor acquired a young bull calf at the sale barn to breed the two cows the owner kept only for the ag exemption they earned. Soon after the young fellow arrived at their farm he appeared in our pasture, an unremarkable black Brangus type with a sale tag still stuck to his hip. We didn't want him in with our cows for several reasons; we didn't have a clue who he was, but we sure knew where he had been - the sale barn. We made every effort to get rid of him, but every time we returned him to his pasture he was back in our place before we could get back home. It seemed that he preferred the assortment of ladies we had to the limited herd at home. He and John Bull got along okay, the owner was totally uninterested in where his bull was as long as his two cows were bred, and we finally gave up at trying to return him home. To our surprise his calves were really nice, he himself grew into a beautiful bull with the kind of quiet disposition we insisted on, and he gained our permission to remain as the visiting Black Bull. 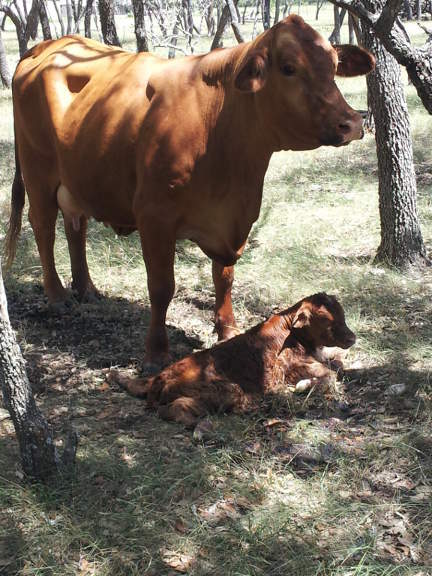 The neighbors moved and eventually so did Black Bull, but not before he presented us with a young bull calf we named Junior, who served us as our herd sire for 11 years. Junior's aging brings us to the "rest of the story" which is presented below. 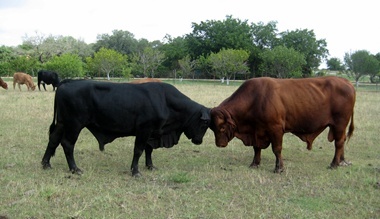 We were so pleased with the breed characteristics of the two black Brangus bulls that we decided to stay with the Brangus breed but chose the Red Brangus and acquired Top Gun (TG) from Baxter Womack, who had been a breeder of these cattle for over 50 years. 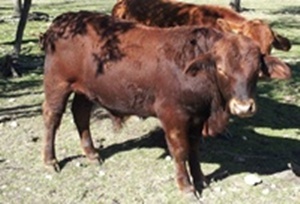 We have misplaced the registration papers on TG, but he was the result of a special breeding arrangement that Baxter and 3 other breeders entered into to use a syndicated bull with a breeding background that would have been otherwise unaffordable for us. 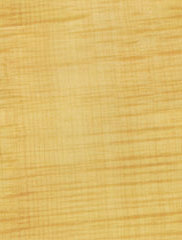 The result you can see in the picture. What you can't see is the gentle nature of the 2,700 pound lap dog. If you could have made him a lap he would have laid down in it. He not only demonstrated the desirable qualities of the breed, but he pasted them on to his offspring as if he was using a cookie cutter. The one faulty characteristic he had that proved to be disastrous was a very long sheath which resulted in an injury at the age of four, ending his performance ability with us. To say it broke our hearts would be an understatement. We went more than the extra mile to try and keep him going, but to no avail. A very sad experience for us all. Junior challenges the arrival of the new kid on the block but youth and size prevailed and the name Top Gun (TG) evolved. 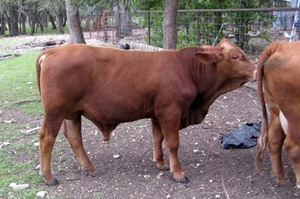 The loss of TG took us back to the Womack ranch to select another herd sire. 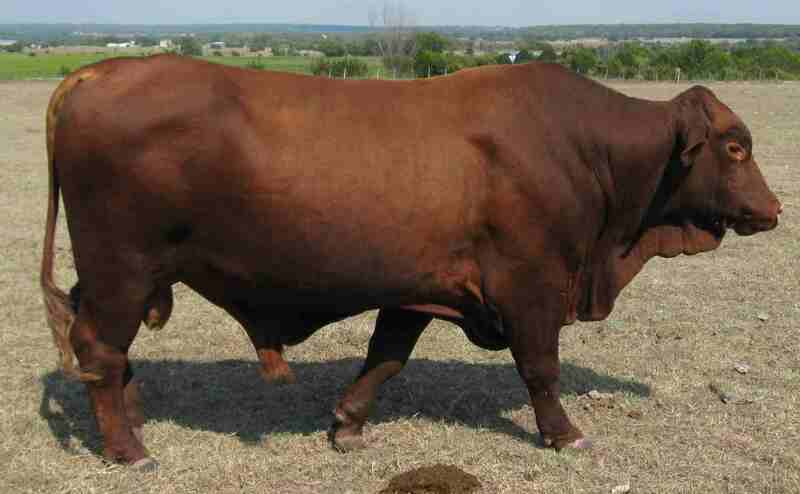 This time one of the selection criteria was sheath length and Samsung 78 was selected from a group of 35 young bulls. He was loaded in a 30 foot covered goose neck trailer and placed in the front compartment; he promptly jumped the dividing gate. He was moved back to the front and Baxter urged us to get the trailer moving to "calm" the bull down. 20 minutes later, at a stop light one mile from entering Interstate 35, Grandson Two and I were hailed by a honking truck stopped behind us. I pulled over, expecting to find the bull hung on the divider gate, but the rather excited man in the truck told us that the bull had jumped out of the trailer some 5 miles back and he had narrowly missed him. Since we were traveling about 55 miles an hour at the time, we feared the worst for the bull's condition. We checked out our trailer and found the problem; an end trailer gate that had not been properly locked in our haste to "get moving." Frantically we retraced our route, looking for a badly injured, very expensive bull calf, but finally found him about a half mile off the highway, standing in the middle of a little narrow, unpaved road. Once found, the immediate question became obvious: how does one load a frightened, potentially injured bull into a trailer from which he had so precipitously exited without the facility of pens, loading chute, or any actual physical bodies to help? After hours of effort, and with the generous help of strangers, we were able to reload the bull, who was thenceforth known as Houdini for obvious reasons. The below left picture is of Houdini soon after he joined us at Keno! Farms. The skinned place visible on the upper part of his shoulder is one site of his injuries from the jump out of the trailer. His knees were heavily skinned as were several other places on his body, but considering the potential injuries he could have suffered, he was basically unhurt. In this picture he is 16 months old. In the picture below right he is 8 years old and mature. It is remarkable what a difference maturity demonstrates. Houdini, like his predecessor, is a gentle giant. 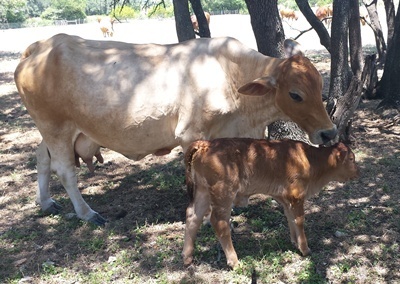 With the cooperation of our excellent mother cows, he has given us outstanding young calves that beautifully perpetuate the breed, as is shown in the following pictures. The pictures below are a sampling of pictures of recent heifers (on the left) and young bulls (on the right). These animals pictured are not currently available, but we have some that are nearly identical in various ages. We keep the calves on their mothers until they are 5 to 6 months old. 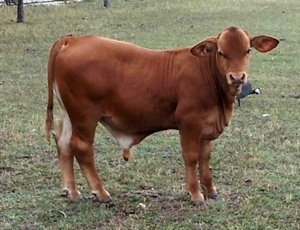 We prefer to sell our calves via private treaty so that our buyers can see the animals with the herd and have the ability to observe both the sire and the dam of the calf. Our buyers prefer the animals they buy not to have been exposed to the potential diseases of the sale barn. They also appreciate getting to see their animals in a natural state where they can observe behaviors. We try to sell the calves by the time they are a year old. 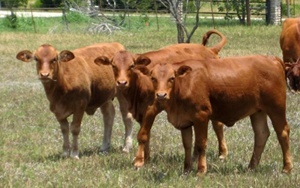 If you are interested in purchasing a quality purebred calf, all of whom will be 7/8 Red Brangus, give us a call and determine what ages we have available. 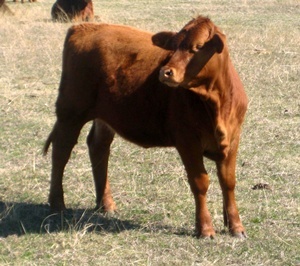 One of the desirable qualities of the Red Brangus breed is small birth weight calves, making for easy delivery. We do not have the acreage divided to allow the separation of our young heifers from the bull, which sometimes results in our having heifers bred sooner than we like. We have some heifers calving shortly after their second birth date and it has been a very long time since we had to assist with a delivery. There is a strong mother instinct in these cows, and along with that tendency they are still accepting of our "interference" when we watch, observe the birth and occasionally help the newborn calf find the dinner table. The calf (left) is 10 minutes old and Mother is vigilant but tolerant of my presence. The calf on the right has just found it's legs and is in search of dinner. "Gentle" is an absolute requirement. 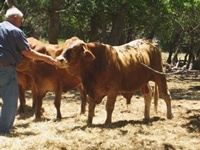 Having raised both kids and grandkids, and having them involved with the cows and calves, having stock that is gentle is a requirement that has received a lot of attention over the years. Any calf that shows any tendency to be spooky or pushy gets to "take a vacation" elsewhere. 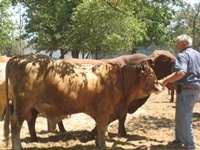 Unyielding focus on this quality has resulted in a herd of the most gentle cows you will have the opportunity to visit. A little "scratch time" is a routine activity with the young stock. Here a couple of young bulls that are ready to find new homes get treated to a little under the jaw scratch and/or a cube treat. A quality often overlooked is the productive lifespan of your Mother herd. This is Bebe, raised on a bottle by our two grandsons at their age of two. 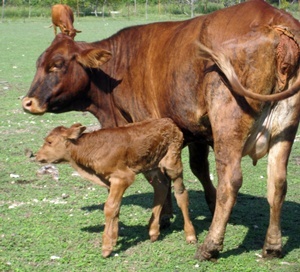 This picture shows Bebe at age 18 with her latest calf age 2 days. Over the productive life of this cow she has missed only one year calving and we are confident that was because of the failure of the bull that year. 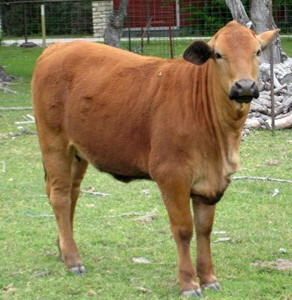 She has good milk production and is in very good shape for her advanced age and is a devoted Mother.